Railway shoulders become rounded with the time and erosion makes them impossible to walk on. The inspection of railway lines requires, however, that the line inspectors be able to walk regularly on the shoulders all along the line. 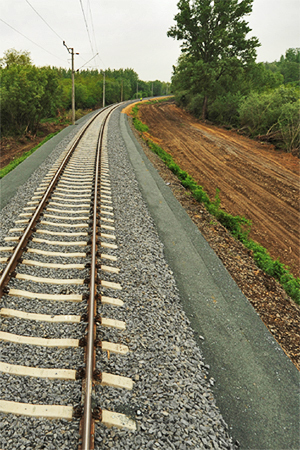 In the modernisation of railway lines higher speed requires changes to the design of the subbase and track; heavier rails, modern sleepers and thicker subbase must be used, track geometry must be changed which results in the "loss" of the shoulder, the curves extend over the shoulders, therefore the broadening of the embankment becomes inevitable. Embankment widening using conventional technologies can be made only from bottom to top, starting from the embankment toe, by stepping the embankment. 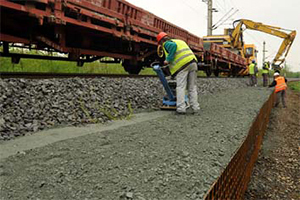 Each step must be wide enough to allow the construction equipment and the roller to work on them parallel with the longitudinal axis of the embankment. Thus, even for a 0.5m widening of the crest width the embankment must be widened by 2.5 m and the excess must be demolished after completion. This is a very costly and time consuming operation. Where the widening of the crest on one side does not exceed 2.5 m, it is practical to use one of the types of Gradex shoulders®. A Gradex-shoulder® is a small retaining wall with a width that provides the necessary shoulder width. (The Gradex-shoulder® is a procedure protected by Industrial Design No. 3 434). Where the widening of the crest on one side does not exceed 2.5 m, it is practical to use one of the types of Gradex shoulders®. Construction is made from the track during track closure or under traffic, in train-free periods. Construction can be well organised, weather conditions do not influence the speed of construction. Furthermore, the use of the land next to the embankment is not required, no appropriation is necessary, no green damage is caused. The procedure can also be applied as a way of widening roads Gradex shoulder® can be constructed for embankments even only 1 m high at a lower cost than that of conventional embankment widening. Where curve correction requires the embankment to be widened by several metres, it is practical to construct a retaining wall reinforced with geosynthetics to avoid the need for appropriation.